The October 21, 1861 Battle of Ball's Bluff, a Confederate victory in Virginia that decisively crowned that year's string of early-war successes in the state, has been covered well and often in the Civil War literature. The 1990s alone witnessed the publication of three major studies during the first half of that decade, Byron Farwell's Ball's Bluff: A Small Battle and Its Long Shadow (1990), William Howard's The Battle of Ball's Bluff: The "Leesburg Affair," October 21, 1861 (1994), and Kim Bernard Holien's Battle at Ball's Bluff (1995). Almost ten years later, in 2004, James Morgan's A Little Short of Boats: The Civil War Battles of Ball's Bluff and Edwards Ferry, October 21 - 22, 1861 superseded all previous efforts at documenting the battle itself, and the gap widened further in 2011 with the release of a revised and expanded edition1. 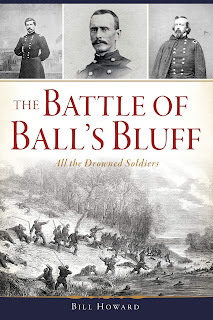 Published this year, William (Bill) Howard's The Battle of Ball's Bluff: All the Drowned Soldiers is a newly revised, expanded, and retitled version of his own 1994 book. A significantly enhanced and updated effort, it goes a great distance toward reestablishing the relevance and stature of the author's work in the face of Morgan's consensus gold standard treatment of the battle. Howard's meticulous reconstruction of the fighting at Ball's Bluff skillfully manages the difficult task of offering readers a highly detailed tactical description of the battle while at the same time presenting the information in an artfully appealing narrative. The strategic situation in northern Virginia during the fall of 1861, particularly the disposition of opposing forces stationed along both sides of the Potomac, is well summarized, as is the origin of the battle itself, which started as the infamous "slight demonstration" before aggressive local Union commanders recklessly expanded the mission into a full-fledged (by 1861 standards) battle. Indeed, the Battle of Ball's Bluff serves as an excellent example of how military clashes often take on lives of their own. As is often the case, at Ball's Bluff the inherent fog and friction of war, combined with good faith mistakes in judgment from those in charge on the ground, led to a military action (and eventual disaster) not at all anticipated by the top planners involved. Accompanied by detailed tactical maps at frequent intervals2 and well stocked with firsthand accounts and impressions, each stage of the battle—the initial river crossing, the opening skirmishes, the escalation of force commitment by both sides, the solidification of the fighting front at the top of the bluff, the eventual Confederate envelopment of the Union position, and the failed breakout attempt that accelerated the panicked Union retreat to the river below—is presented in clear and reasonably balanced (the narrative is weighted toward the Union perspective) fashion. The brave but inexperienced Union commander on the ground, Col. Edward Baker, is appropriately criticized for rashly pushing troops across the river without a clear idea of the military situation on the other side and for his poorly arranged battle line. While Howard holds Col. Baker's misguided initiative primarily responsible for how the battle turned out, the author also feels that Baker's division commander, General Charles P. Stone, should have made a more concerted effort to inform himself about what was happening and should have moved closer to the action (perhaps even overseeing the operation in person). To be fair, though, Stone never received any indication from the field reports he did receive that things were going wrong or that his demonstration had turned into a real battle that endangered a large part of his command. Sadly for Stone, it was politically inexpedient to hold a respected war martyr (especially one who was a U.S. Senator and personal friend of the president) chiefly to blame for the casualty-heavy fiasco, and the inevitable mission to find an acceptable scapegoat quickly found a rich target in the politically naive Massachusetts general. Howard perceptively observes that Stone, unlike so many of his other professional and non-professional general officer colleagues, did not make any effort to cultivate political allies in the capital, even after having had a large hand in securing the District of Columbia during the early months of the war. The extremely shabby treatment of Stone, who was arrested and imprisoned for 189 days but never formally charged, is recounted at some length in the book. No other high-ranking general would be treated this way during the war, and it rebounds to the credit of neither leader that both General McClellan and President Lincoln declined to intervene in what was obviously a travesty. The Union debacle at Ball's Bluff was strategically insignificant and the losses catastrophic only by early-war expectations, and Howard is certainly correct to deem the battle's chief legacy to be its important role (in conjunction with other federal defeats that year) in prompting the formation of the Joint Committee on the Conduct of the War. Though the investigative committee did some demonstrably helpful things to aid the Union war effort (ex. weeding out corruption in war contracts), most scholars feel that its radically partisan members too frequently interfered counterproductively in both military affairs and administration prerogatives. Howard's informed appreciation of these aspects of Ball's Bluff's lasting influence is another strength of the book. Like most volumes from this publisher's Civil War series, The Battle of Ball's Bluff is filled with period photographs and other illustrations. More useful extras can also be found in the appendix section. Among historical documents and other items of interest located there are Howard's updated casualty rosters and tables. In the end, the leading Ball's Bluff studies of James Morgan and Bill Howard complement each other well. Morgan's more narrowly-focused battle study exhibits deeper research, engages in historiographical debate and diversion more extensively, gives full treatment to Edward's Ferry (which is only a minor part of Howard's study), and also serves as a touring guide, but Howard's book is the reading option best balanced between battle detail, wide audience appeal, and post-battle context. 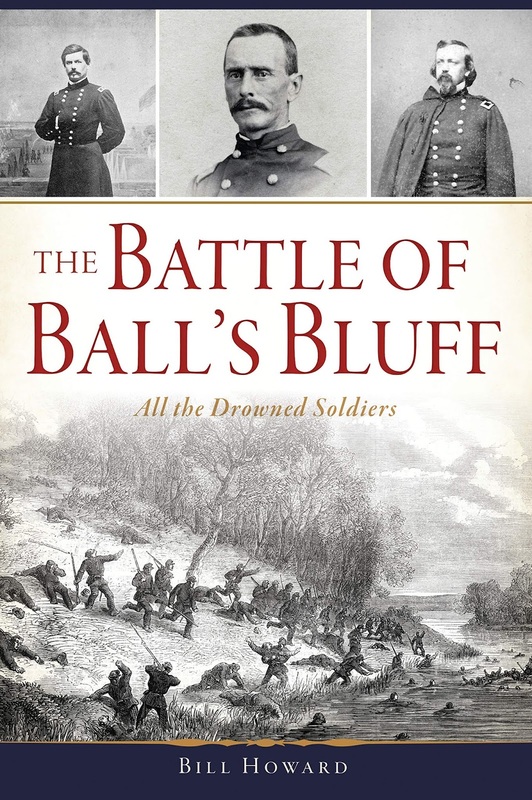 Whereas the long-term plight of General Stone and the damaging political fallout from Ball's Bluff are beyond the scope of Morgan's investigation, they are integral to Howard's, filling four chapters in The Battle of Ball's Bluff. Both updated works are essential. 1 - The book's map set is drawn from Ted Ballard's Staff Ride Guide: Battle of Ball's Bluff (U.S. Army Center of Military History, 2014). 2 - The first edition of Morgan's book was put out by Ironclad Publishing (now defunct) in paperback. The revised and expanded edition A Little Short of Boats: The Civil War Battles of Ball's Bluff and Edwards Ferry, October 21 - 22, 1861 was published in hardcover by Savas Beatie in 2011.